So a few weeks ago I was contacted by the people at the Sunshine Bottle Works asking if I’d like to try their root beer. It is all natural, but they assured me it wasn’t like some of the nasty ones I’d try. And I said … of course I said yes. I’d say yes if they said they’d made the worst root beer in the world and wanted confirmation, or if they said it was the most generic thing out there. I always say yes to trying root beer. Sunshine Bottle Works started making craft sodas in 2014, with a desire to make sodas to match the modern lifestyle of the Central Coast. In talking with the owner, he thought that all natural root beers should be judged in their own category, since they it isn’t fair competing against artificial ingredients. I disagree. 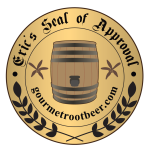 With the exception of safrole, all ingredients of root beer can be natural, and sassafras root extracts with the safrole removed are fine to use. It’s just more expensive. I’ve had plenty of amazing all natural root beers and plenty of artificial garbage. What you do with the ingredients and how you proportion them is far more important then whether they are all natural or not. And, if you do it right, the all natural ones should end up better. Real vanilla, honey, and spices can taste much better than the fake, if mixed at the proper ratios. So no, it’s perfectly fair to compare the natural to the not all naturals. And how did they do? You already saw the Seal up top, they nailed it. It’s got a nice sweet, creamy body with wintergreen and birch notes. The Bite is a little sharp with spices but doesn’t finish as smooth as I prefer. The Head is nice and tall and foamy, just how I like it. The Aftertaste is a nice vanilla with some minty hints. This is quite a fine brew, even when compared against those with the “unfair” advantage. They had nothing to worry about. Let this continue to be the lesson to you all. Great brews need more than just great ingredients, they need those ingredients to be expertly prepared, such preparation is in adequate supply at the Sunshine Bottle Works. Good job. See how it rates against other root beers.